When taking a show which is currently on the air and placing it in the cinemas as a movie, you better make sure that it delivers something movie-worthy. The opening of The Simpsons Movie highlighted this when Homer announces (albeit about the Itchy and Scratchy Movie) “Why are we paying for something we can watch at home for free?” People will have been asking this question in 1999, when South Park was only two years old and at the height of it’s popularity. Luckily, South Park creators Matt Stone and Trey Parker understood what they were doing. They already had a show which was hugely offensive and pushed the boundaries of TV censorship but a movie gave them freedom and South Park’s movie uses that to it’s full potential. This means that the already swear-filled movie now had even cruder language, more offensive material, a host of “guest-stars” (whether they liked it or not) and best of all, a story which is not just very funny, as creative as the show consistently is but also epic enough that it feels like a movie is needed to contain it. It isn’t just the “uncut” nature of the movie which helps it stand-out amongst it’s peers. The movie is a musical, with songs punctuating most of the major scenes. 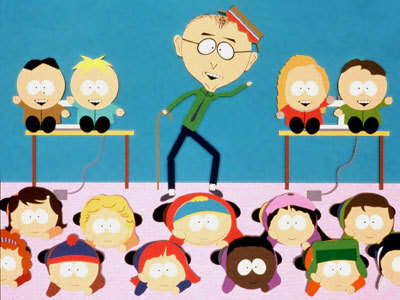 From the opening number, sang by Stan and accompanied by the surrounding town through to the epic, Oscar nominated “Blame Canada,” the South Park movie is written and staged as a musical and is much the better for it. The songs are not just really funny but genuinely very good and many will stay stuck in your head for days afterwards. As great as this movie is though, it does suffer from a story with a huge amount of threads to pull together. Some of those threads are very clever and you get a finale which satisfies in some instances but there are also times when it feel very chaotic. It is the South Park movie though and is hardly supposed to be high drama or written as an Oscar nominated screenplay. Overall, South Park: Bigger, Longer and Uncut lives up to it’s sub-title. It delivers on the swears, offensive material and best of all, songs. The story feels epic, if somewhat bloated but you’ll look past that when it is this funny.